Canada is considered a ‘severe weather’ climate. Recommended service should take place at every 6,000km or every 6 months, or as indicated in the ‘Severe Weather Schedule’ in your Owner’s Manual. Why is it important to service your Kia in accordance with the factory Recommended Maintenance Schedule? By servicing your vehicle in accordance with the factory Recommended Maintenance Schedule, your vehicle will maintain warranty coverage, ensures a higher vehicle resale value, helps to prevent costly repairs, extends the life of the vehicle, decreases the chances of a mechanical breakdown and ensures optimum fuel economy. Please consult our Service Advisors for details. In today's world our busy schedules keep us running to practice, grabbing groceries and driving to work through miles of traffic. Foster Kia understands your busy schedule and wants to make your service experience quick and affordable. 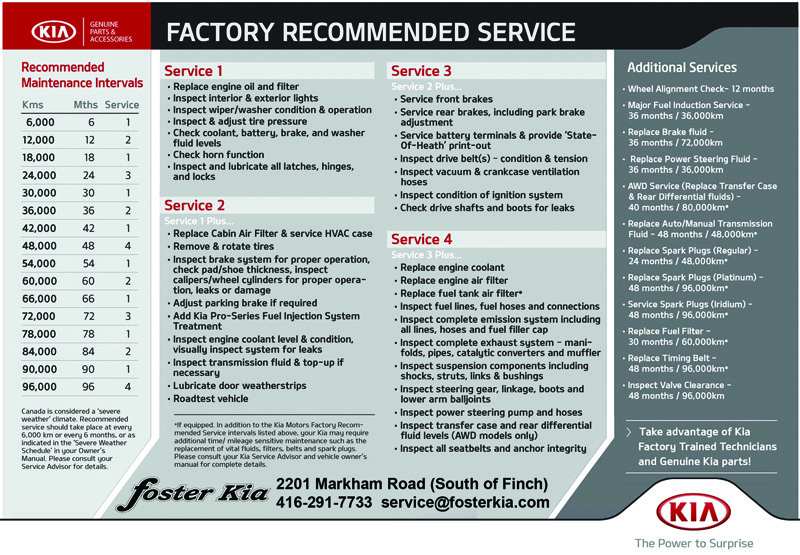 At Foster Kia, we only perform services that are needed. When they're really needed! So you only pay for what's required today. We're dedicated to earning your business every time you bring your vehicle to us, so you'll want to come back the next time. That's the promise we make to you. Now you be the judge. Servicing your own fleet? Wholesale and fleet discounts make us an ideal business to deal with. Talk to us today! 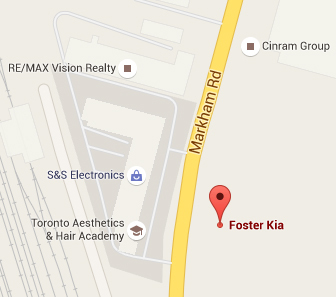 Foster Kia provides its customers with a free shuttle service. We appreciate you choosing Foster for your car needs, and strive to make you completely satisfied. Our shuttle bus picks up and drops off customers within the area bounded by 407, Neilson, Eglinton and Bayview during peak rush hours in the morning (8:00 to 10:00) and evening (4:00 to 6:00). Customers going beyond these points can be dropped off at the Don Mills or Kennedy subway stations or at the Agincourt or Oriole GO stations. Service to areas beyond these boundaries is available outside peak hours by special arrangement.